What are Japan’s pension fund losses after the Nikkei wipeout from 21k to 17K? Less than 24 hours we got the answer, when moments ago Nikkei reported thatQ3 losses at (at least one) pension funds were just under JPY 10 trillion in the third quarter. With Japan’s economy already sliding into its 5th recession of the past decade, once pensioners open their retirement statements in a few weeks and find a 15% plunge in their purchasing power, Japan can skip recession and proceed straight to a consumer-driven recession. 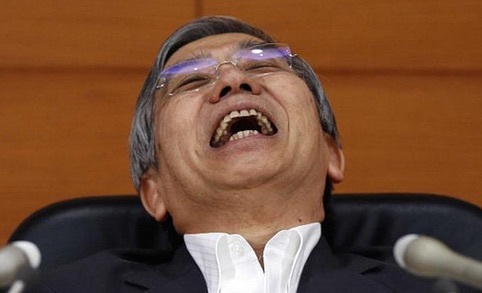 And just like that, with or without Krugman’s active economic advice, Japan’s fate is sealed because much to Japan’s dismay, “junk” bonds are called that for a reason. The good news for US shale companies: they just got a 6-9 month reprieve thanks to millions of Japanese pensioners who will starve to death in a few years. This is probably bad news for oil as the scramble to issue junk bonds in the coming weeks to take advantage of Japanese idiocy means taht the oil spigots will be turned on full blast.